I've lengthened my bigCCI to 144 on most periodicites to better define the trend. It started with the indicies as we entered this almost one time frame environment. The idea spread to other markets. I'm trading Crude, Gold, Currencies as well as various stock indices. The thing worth mentioning is that a portion of my trades last up to 48 hours or so. There are a lot of opportunities holding "overnight". The markets are almost 24 x 7 so why shouldn't there be opportunity at all hours. The chart below is one such trade. I've been selling the Euro/$ since just above 1.39. I have missed some of the gaps down but by holding my trades longer this has been minimized. 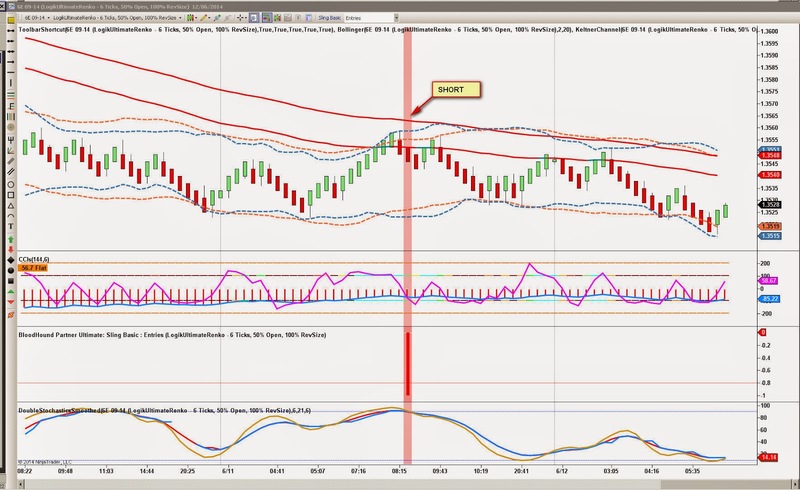 The NinjaTrader chart shows the Bloodhound logic choosing the "right" sling (pullback/thrust) for a very good entry. I've got a stochastic on the chart to show that cyclicality is not enough. An entry picture conforms to what I need to see when I'm trading as a discretionary trader. All those conditions must be in my entry logic for a signal or auto entry. I'm still short some on this trade, eventually looking for 1.335 as my next major target but I'll be in and out a number of times before then. Long time reader here. Keep up the good work! By the way how is the book coming along? Book is slow. Life keeps getting in the way but its coming. On most trade we can win if we have the right stop placement, that's what I struggle the most, finding the right spot for the stop. Just curious, where was your stop on that trade, was it just above the recent swing high or some number based on back testing? Stops are bad if they are based upon anything else than change of trend if the entry is for a trend trade. My exit was the bigCCI crossing zero. Otherwise I'd add to the trade.